* Fly dual, as co-pilot, with your Instructor . * You may take controls after take-off. * Bring a camera! Record your first flight! * We normally land back where we started. 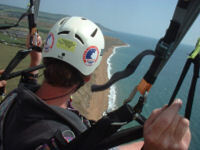 * Cliff soaring flight often lasts 20 mins * Weather dependent!